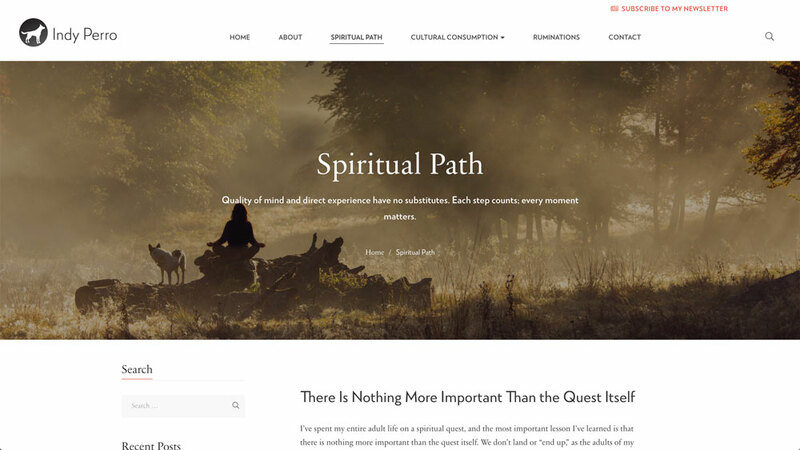 In mid-January of 2019, we connected with Indy Perro, a Colorado-based author, and academic who desired a newly-designed website and logo to help market their content and their upcoming publication, arriving later this year. Indy Perro had an excellent idea for their site, which centered around anonymity, marketing, and engaging site visitors to join in cultural citizenship, which refers to the right to be different and to belong in a participatory democratic sense. 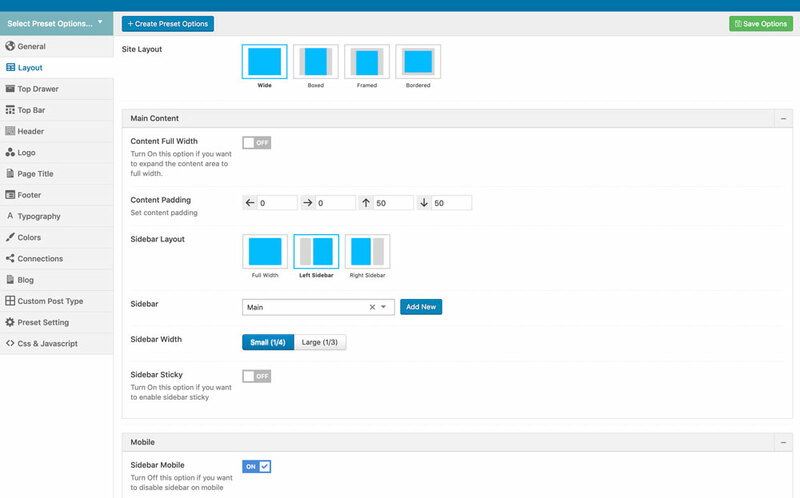 With this information in mind, we understood that Indy Perro would need a fully customizable WordPress theme that would allow for composing and publishing new content on a daily to weekly basis. Additionally, Indy Perro's site would need to be professional, marketable, and reflect their love of all things culture.. The first step in our process working with Indy Perro was to create a logo design and brand identity that reflected their authorly persona. We chose a font pairing of two contrasting fonts that worked well to accomplish this goal. The first font we chose was RNS Miles, a beautiful, modern geometric sans-serif font with multilingual variants. We used this font as the cornerstone of Indy Perro's logo and the secondary font-family on their site (sub-headers, links, captions, etc.). The second font we used was Sabon Next, a classic, elegant serif font. 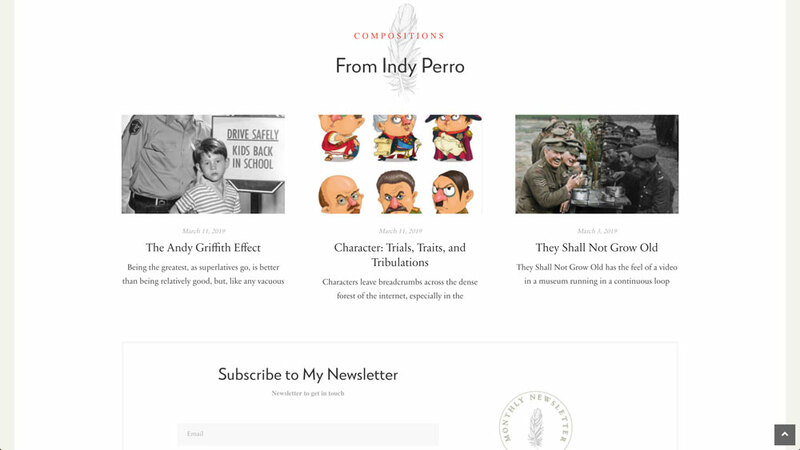 This font perfectly complimented RNS Miles and helped to create the authorly persona for Indy Perro's site. We used a simple color palette consisting of three primary colors. 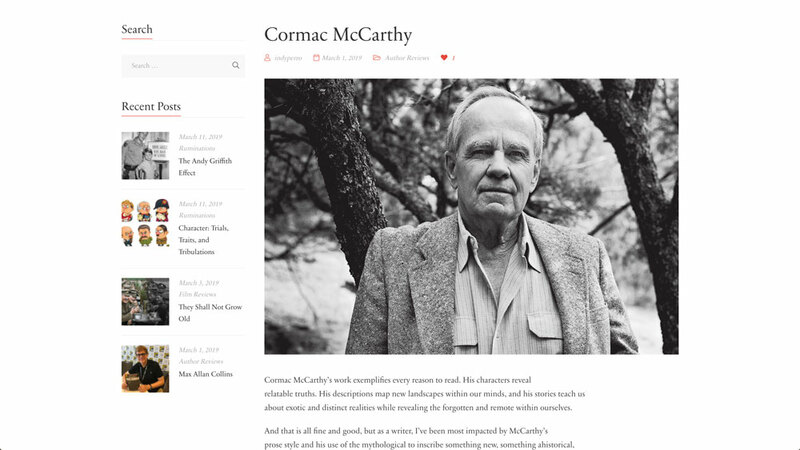 We chose #333, a dark-gray color, as the body and header font, #fefbf6, an off-white tan, as the background color, and #e4493d, a reddish-orange color for links, subheadings, and decorative fonts. These three colors helped bring home the sense of modernity and professional on the site and in branded content. Indy Perro expressed that they wanted the logo to center around a dog's silhouette. 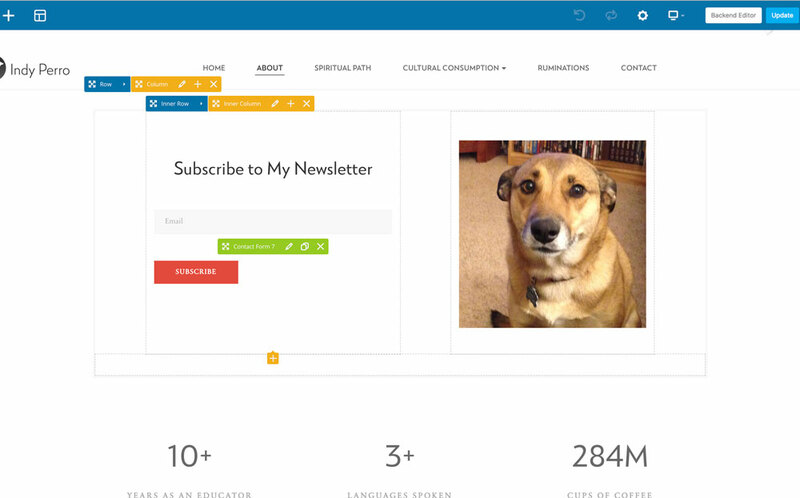 We began by providing Indy Perro with three different concepts to choose from. After narrowing down an idea, we used a variety of dog silhouettes until we landed on a German Sheppard mix that would be the centerpiece for the logo. Since Indy Perro writes under a pen name, we wanted to make sure the logo was simple, professional, and identifiable with their persona. We are excited to see Indy Perro's logo printed on the back of their publication, arriving on Amazon and bookstores later this year! 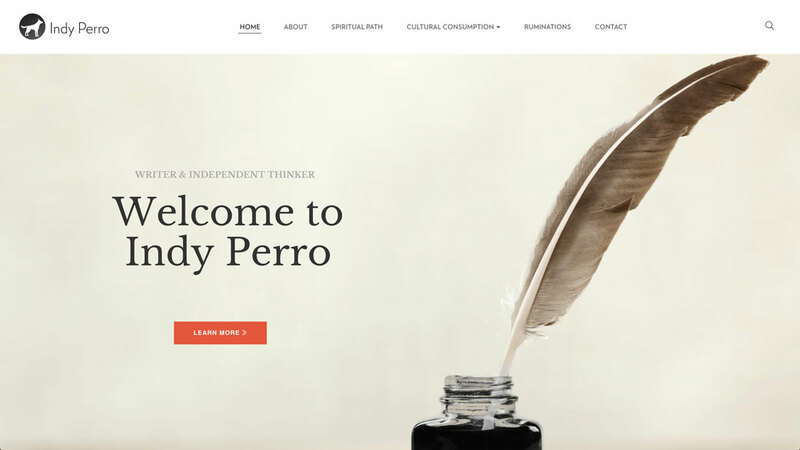 This was one of the best experiences we have had working alongside Indy Perro on their brand identity, logo, and Wordpress website. Indy Perro was incredibly professional, prompt, and easy-going, which made the project fun, engaging, and incredibly meaningful. 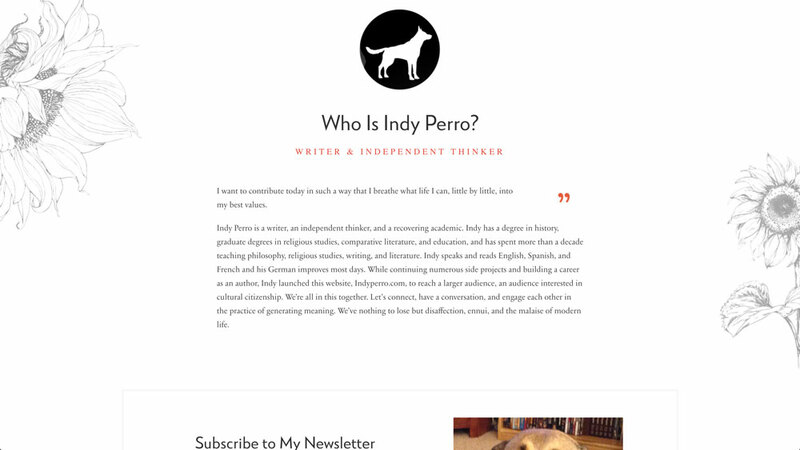 We are excited to continue working with Indy Perro on marketing their publication, designing email marketing templates, and updating their Wordpress website in the future. Take some time sharing this project and let us know what you thought! Turn Your Passions into a Thriving Business. Get Started and Contact Us Today!